The annual National Collegiate Book Collecting Contest aims to encourage young collectors to become accomplished bibliophiles. The 2017 contest winners have built up fascinating collections on topics as diverse as teaching mathematics, the literary history of the Maine woods, and seminal cyberpunk novels. We asked the winners a few questions about their collections. ABAA: Could you give us a brief description of your collection? AK: My collection, The Breath and Breadth of the Maine Woods, is an examination of the manners in which the Maine woods has influence. These numerous books, as well as related ephemera, are the breath of the Maine woods. They are the exhalations of centuries of life in Maine, and love for its forested lands. 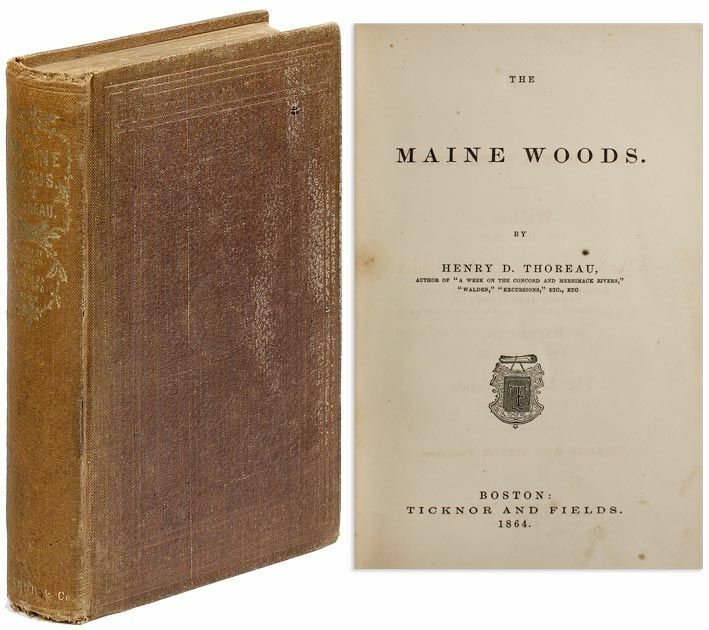 From mid-19th Century ephemera and books on history to turn of the 20th Century fictional accounts of log drives, and from mid-20th Century town histories to 21st Century poetry, these works show the breadth of thought and examination of the Maine woods. From collecting and reading these works it is clear that the Maine woods form an important basis for the livelihoods, industries, and recreation that has made Maine a resilient and awe-inspiring land. ABAA: What first interested you in collecting items related to the Maine Woods? AK: I have always been fascinated by the forest, and by Maine. From my earliest memories I recall spending time with my father driving down logging roads to go fishing at remote lakes and ponds, playing beneath the canopies of mixed hardwood stands, and climbing Eastern White Pines to look out over the landscape. I have also always had a love of books, and it makes sense that these two loves combined into a collection of works on the Maine woods. I also collect antique Maine made tools, and do historical research on the craftsmen who made these tools, and the trades in which they were used. Although I have always had a handful of works on this topic, I only began collecting books related to the forested lands of Maine in earnest in the past few years. The wealth of knowledge available is staggering, and I am constantly discovering the existence of works that I hope to acquire. ABAA: What currently has pride of place in your collection? AK: I think that my entire collection, in some ways, could be a response to this question. Currently I would include my two copies of The Penobscot Man by Fannie Hardy Eckstorm, both first editions, my copy of Maine in the Northeastern Boundary Controversy by former state historian Henry S. Burrage (which I acquired since my submission to the NCBCC), and broadly my collection of billheads and other ephemera related to the industries that used Maine's wood products in the mid 19th and early 20th Centuries. It is hard to define what holds a special place in my collection, as there is so much material within it. Perhaps I should also include All among the Loggers; Or, Norman Carver's Winter in a Lumber Camp, published in 1908 and written by Clarence Burleigh. I have a signed edition of this, his first work in the Norman Carver series, and it is a fascinating semi-fictional account of logging in the early 20th Century. It is a fine example of the types of works that inspired young men to a life working in the woods. MG: My collection encompasses the Transcendentalist movement of the nineteenth century. Transcendentalism is best known for the works of such writers as Ralph Waldo Emerson, Margaret Fuller, and Henry David Thoreau, but it also includes a number of other individuals who shared a feeling for what Christopher Pearse Cranch once described as “a new spirit of truth.” From its beginnings as a religious demonstration within the Unitarian church of Boston, it expanded to include revolutionary ideas about the self and society, democracy and human rights, and on human nature and the natural world. It resulted in utopian reforms, abolitionist activities, and all manner of philosophy and literature. Transcendentalism’s legacy is one that transformed American culture, and its literature continues to inspire its readers today. The Transcendentalists were an expansive group of writers, and in my collection I have tried to encapsulate their many religious, social, political, and literary expressions. Among the items featured in my collection are: a rare first edition of Emerson’s Nature, the foundational text of the Transcendentalist movement; scarce pamphlets of Emerson’s “The American Scholar” and “The Divinity School Address”; pamphlets from “miracles controversy” between George Ripley, Andrews Norton, and “Levi Blodgett”; Elizabeth Peabody’s Record of a School, Theodore Parker’s “Discourse on the Transient and Permanent in Christianity”; Margaret Fuller’s Summer on the Lakes and Woman in the Nineteenth Century; speeches in the abolitionist newspaper The Liberator; a complete set of Emerson’s Essays in near fine condition; poems by Jones Very, Christopher Pearse Cranch, and Ellery Channing; and a complete set of first editions by Henry David Thoreau, including A Week on the Concord and Merrimack Rivers and Walden. A number of first book and magazine contributions are present, ranging from an annual gift book, several anti-slavery anthologies, and an original issue of the Transcendentalist journal The Dial. The collection also includes some manuscript and photographic items. ABAA: What first interested you in collecting items related to the American Transcendentalists? MG: This collection really came about through my dissertation research on the Transcendentalists. Earlier in my book collecting I collected everything that belonged to the literary history of New England. I eventually began to focus my collecting on the Transcendentalists to assist me as I started writing my dissertation. So I sold all of my seventeenth- and eighteenth-century books—including first editions by Thomas Shepard and Jonathan Edwards—and nearly all the rare books I owned that were published after 1900 (with the exception of my near-complete Robert Frost collection) and started buying as much as I could. Each time I did some research I would add something to my wants list, then see if it was for sale somewhere. Not only did I build up a large collection of primary texts but I gained an invaluable education in nineteenth-century book history. I remember my former advisor, the late Barbara Packer, telling me about the amazing collection of Joel Myerson. Professor Myerson began collecting as a graduate student and eventually amassed the most comprehensive collection of Transcendentalism in the world. And like me, he sees his collection as a working library to be used and shared with other scholars. While I doubt my collection will ever match Professor Myerson’s collection—which is now a permanent part of the Thomas Cooper Library at the University of South Carolina—I hope it can be put to good use by myself and potentially others in the future. MG: I have to say, even though Henry Thoreau is my favorite writer of the group, it’s hard to top the first edition of Emerson’s Nature. It is the first and the most important book of Emerson’s literary career. It is one of the most influential books ever written. And it is the foundational text for all of Transcendentalism. Nature was a controversial little book for its day. Published anonymously in 1836, it found its first audience amongst Emerson’s intellectual intimates who made up the now famous Transcendental Club. Today it remains as Emerson’s synthesis of philosophical idealism in the form of poetic prose that confirms the author’s faith in one’s individual soul, reading like an extended essay on the joy of a life moving ever closer toward moral perfection. Telling his reader that, “the foregoing generations beheld God and nature face to face,” an enthusiastic and optimistic Emerson is of the conviction that new scriptures can be written in the present if one can only see the divine workings in the natural world and in one’s own mind. For “the sun shines today also,” Nature inspires and encourages its reader to, “Build therefore your own world,” from one’s own thoughts and ideas that have the power to transform the universe. Nature had a transformative effect on me when I first read it. I was about the same age as Emerson when he wrote the book, and I think that is why it felt so fresh, so vital to me then. I consider myself very lucky to have a copy of this rare and important book. XG: I learned to love mathematics through story telling. One book in particular enchanted me. The Number Devil is about a third-grader named Robert, who struggles in his boring math class until the mysterious "Number Devil" Teplotaxl introduces him to the wonder of mathematics in twelve magical dreams. The Number Devil showed me how mathematics is beautiful, exciting, and connected, with a reappearing cast of characters popping up in the most unexpected yet, in hindsight, appropriate places, just like an intricate and well-told story. I am reminded that the Spanish language uses the same verb—contar—for counting numbers and telling a story. So, for me mathematics is a story, with a beginning and a middle, but with no end. So, too, my collection of math books. My collection has evolved over time in four distinct phases: (i) childhood collecting of fables and fairytales, (ii) middle school collecting of competition math books, (iii) high school collecting of big-picture “popular” works, and (iv) college collecting of the masterpieces of advanced mathematics. While I do have some exquisite physical books in my collection—most notably Gauss's Disquisitiones Arithmeticae—many of my most meaningful items are well-loved and well-worn paperbacks purchased from Amazon. It is not the binding, but rather the ideas bound up in them, that have counted in my calculus of book selection. In addition to my own selections, many of the books are gifts from family members. Other books are gifts from teachers and friends. I cherish these gifts as even more special than any book I chose on my own because they show how math brings people together. "Books That Count" stands for the proposition that math—far from being an esoteric realm of academia—touches on every aspect of life. Math, too, has its histories and personalities; math, too, has its philosophies and mysteries; math, too, has its story and its drama. "Books That Count" asserts that everyone can come to love math though our fundamental need to tell and hear and share stories. My collection of math books has become my story. More broadly, "Books That Count" argues for a fundamental reform in math education. We should move away from the Mr. Boeckel arithmetic exercises pilloried in The Number Devil and towards an integrative curriculum that introduces students to mathematics in all its facets: through games, through art, through history, through biography, and, ultimately, through stories. For mathematics is a story. It is a children's fantasy. It is a historical saga. It is a poignant piece of social realism. It is a philosophy, a mystery, a tragedy of great minds lost too early, an all-too-human comedy, a never-ending quest. Math is a story—intricately constructed, with a cast of characters reappearing in the most unexpected, but appropriate, places. As my abuelita Nelly once told me, counting numbers is like telling a story. Books can count. Books do count. And I will continue to count on them to illuminate the wider worlds of mathematics and human experience. ABAA: What first interested you in teaching mathematics? XG: I am interested both researching and teaching mathematics. My immediate goal is to pursue advanced research, and make breakthroughs, in pure or applied math. My ultimate goal is to promote public interest in math and to engage mathematicians in the promotion of the public interest. I did a summer research program at Emory this past summer under the direction of Prof. Ken Ono, who was the mathematical consultant for the feature film "The Man Who Knew Infinity," about the Indian mathematical genius Ramanujan. I really enjoyed working with him and my teammates and the experience of mathematical research. On the other hand, I have long enjoyed teaching math. In fact, probably my first taste of teaching was being so excited by The Number Devil that I wanted to pass it on to one of my fellow grade students! Whenever I gain knowledge my favorite part is passing it on. XG: The Number Devil will always have a special place in my heart — my collection would not exist without that book. 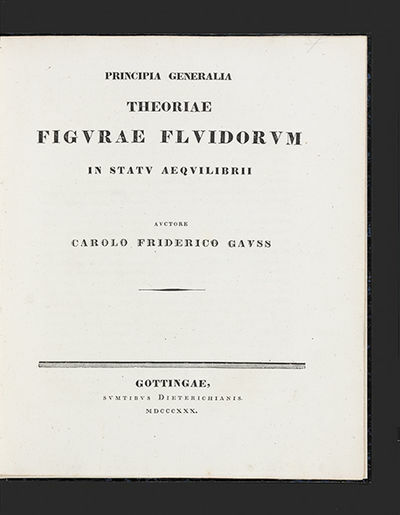 Probably my coolest book is the Disquisitiones Arithmeticae by Carl Friedrich Gauss. My Algebra I Prof Benedict Gross called the best math book ever written. When I won the Harvard Detur Book Prize for academic performance in the freshman year I was given the chance to choose any book which Harvard would then purchase for me and emboss with a cool seal and the Dean's Signature. I had just taken Prof. Gross's course, so chose the Disquisitiones Arithmeticae. Receiving that book was very special for me, for my father, who studied History and Literature, had also won the Detur Prize and had chosen the Riverside Shakespeare. I even got Prof. Gross to sign my copy of the the Disquisitiones Arithmeticae when we visited him in San Diego on our spring break trip for tennis! This book is probably the closest thing I have to a "collector's item" (albeit for folks who really like math!) in my collection. SL: I collect cyberpunk books, with a focus on works by and about William Gibson. Cyberpunk is a 1980's science fiction subgenre that depicts troubled near futures—often described as low-life, high tech, societies with extraordinary technological growth marred by corrupt and capitalistic institutions. The “cyber” part of cyberpunk has to do with the speculation about the rapidly changing information technology of that era: virtual reality, artificial intelligence, and cybernetic enhancements. The “punk” part ties into broader punk counterculture: radical change, resistance, and avoiding the dominant post-industrial milieu. Gibson is the most well-known (and my favorite) cyberpunk author and can be credited with establishing most of the genre’s conventions. My collection also includes proto- and post-cyberpunk books that influenced or were influenced by the genre and speak to cyberpunk’s position within the science fiction canon. ABAA: What first interested you in cyberpunk and William Gibson in particular? SL: I actually fell in love with Gibson’s books first and didn’t realize they existed within a broader context until later. I had the opportunity to attend Iowa Young Writers’ Studio between my sophomore and junior year of high school. 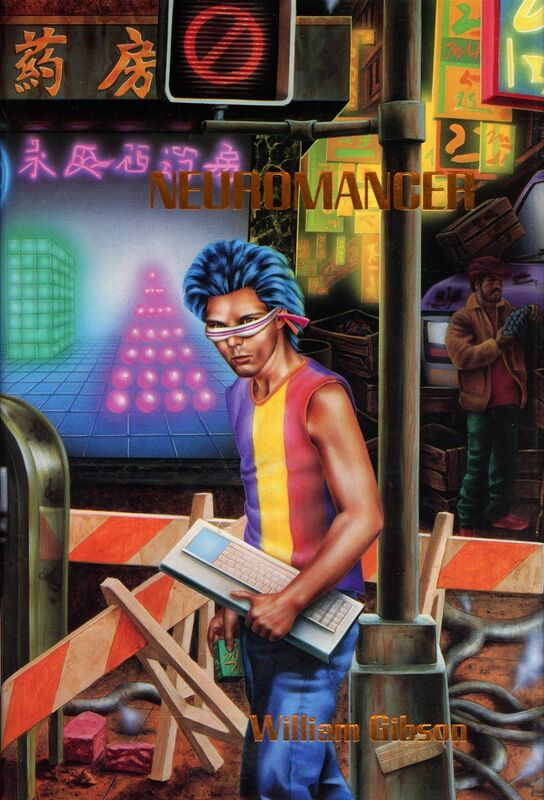 One of my friends there insisted I read Neuromancer, which is Gibson’s first novel. I read the book three or four times between being at Iowa mid-July and going back to school in the fall, and then I read all of his other books during junior year. The word “cyberpunk” came up a handful of times during that period, but I didn’t start to seriously think about it until the following summer. Gibson’s writing is lovely. I’ve always struggled to describe why I love it as much as I do. I read a review of Gibson’s nonfiction collection Distrust that Particular Flavor which describes him as a “first-class noticer” and I think that’s a good way to put it. He has a penchant for capturing harrowingly specific details about persons and places. There are a few interviews where Gibson mentions that he watches how people interact with technology instead of worrying about the specs of technology itself. I imagine this has helped him considerably in creating these tremendous images of the future. A line from Neuromancer goes, “the present tense made him nervous” – “him” being the protagonist Case in that specific moment in the story, but the quotation perfectly captures the anxieties we have about rapidly evolving technological and sociocultural and political landscapes. It’s always fun to try and explain cyberpunk to people my own age because there are some corny elements – people having electric sockets into their skulls to “plug in” for example – that make the genre seem very dated. Personally I find it very uncanny how much cyberpunk authors got right, considering the ubiquitous technologies then versus now. I also have a lot of frustration with how books are often categorized as either “genre” or “literary.” I know many people (particularly in the academy) write off speculative fiction without considering how many of the finest, and, I’d argue, most relevant books have “genre” elements: Frankenstein, The Handmaid’s Tale, 1984, Brave New World, etc. Cyberpunk has an unavoidable loud neon dystopia iconography with cybernetic enhancements and VR, and the contrarian part of me was absolutely drawn to that. SL: When I was visiting Seattle this summer, I went to the bookstore Twice Sold Tales in Capitol Hill. I picked up a handful of cyberpunk paperbacks (Wetware and Freeware by Rudy Rucker, Islands in the Net by Bruce Sterling, and Burning Bright by Melissa Scott) and when I was checking out the owner Jamie mentioned I might want to take a peek at the locked display case. There was a 10th Anniversary Ace Books edition of Neuromancer in excellent condition priced well below its usual retail value. I am incredibly pleased and grateful to have added this edition to my collection.